In dealing with Varoufakis, I am reminded of Sam Brown’s quip: “Never offend people with style when you can offend them with substance.” In other words, there is no need to talk about Varoufakis’ shirts, his motorcycle and helmet, his photo shoots, his constant interviewing, his escape to Aegina the night of a historic vote, etc. The substantive case against him is simple and consists of three charges. First, his entire negotiating position was premised on the idea that the Eurozone would cave in order to avoid Grexit. Of course, Varoufakis has told us that German Finance Wolfgang Schäuble warned him that he would push for Grexit—which means that either Varoufakis did not believe him or did not think that Schäuble’s threat was credible. Any sensible observer of European politics understands that even though the Eurozone is willing to do a lot to preserve the currency union, it is not willing to capitulate to a member who is asking for money without any quid pro quo. In other words, the premise was, from the beginning, unrealistic, and in pursuit of his negotiating strategy, he did Greece enormous damage. Second, Varoufakis did nothing to do strengthen Greece’s position during the negotiations. He confused lecturing other finance ministers with “diplomacy” and managed to turn every single Eurozone country against Greece. Nor did his public diplomacy do much good—it turned him into a rock star, but without any improvement in Greece’s diplomatic hand. I cannot think of a country that has squandered so much capital so quickly. Nor did he find other ways to boost Greece’s hands; his “Plan B,” for instance, could have helped Greece withstand pressure from the European Central Bank for a few days or weeks; but it is hard to see why the other side would blink first. Third, Varoufakis was/is so consumed with the idea of debt relief that he seems unable to contemplate anything else. He was unable to discuss specifics on the budget, nor was he able to produce a realistic numeric plan that converted the proposed reforms into fiscal outcomes/targets. He was, in short, not a technocrat (technocracy assumes some competence) but an entertainer. His only ideas that we will remember are either the ludicrous (the under-cover tax collectors) or dangerous (IOUs, parallel banking system). In short: he started with a false premise about how the Eurozone functions, he was unable to build coalitions or any momentum for his cause, and he was incapable of moving beyond “debt relief” as a strategy to help Greece exit the current crisis. It was these mistakes that history will note, together with the catastrophic consequences of his tenure for the Greek economy. In some ways, the agreement between Greece and the European offers Greece a second chance—a second chance to avoid the mistakes that previous governments made since 2010. Alexis Tsipras comes into this challenge with unquestionable assets: he is enormously popular; he has a fresh mandate; there is no obvious challenger within his party or outside of it; the opposition parties in parliament are willing to support him and he should have no trouble staying on for his full term; the stakes of failure are clear to all (Grexit); and, as a left-of-center politician, he is less vulnerable to attacks. What can Tsipras learn from George Papandreou and Antonis Samaras? First, move fast and close issues. Every new government has a honeymoon period, and Tsipras has room to maneuver while there is unity across political parties for a pro-European agenda. He needs to capitalize on this momentum and move fast before opposition to him emerges and before reform fatigue starts to creep up to slow down bills through parliament or implementation through the bureaucracy. Tsipras also needs to close issues. This was a problem for Papandreou: he would start fights and never finish them, and so his government ended up clashing with an ever increasing avalanche of opposition. In my book, I quoted Samuel Huntington: “To achieve his goals the reformer should separate and isolate one issue from another, but, having done this, he should, when the time is ripe, dispose of each issue as rapidly as possible, removing it from the political agenda before his opponents are able to mobilize their forces.” This is as good advice as ever. Second, be fair and consistent. This was another problem that Papandreou, in particular, exhibited. As long as Greeks felt that “we are all in this together” they were willing to tolerate pain. The problems started once certain groups started to be excluded—for instance, once the liberalization of “closed professions” turned to be an illusion and powerful groups could secure exemptions or delays in implementing the law. Meanwhile, the broader charge—that systematic threats such as corruption and tax evasion were never seriously tackled—only fed the impression that the crisis hit some but not others. Consistency is essential. Third, don’t govern for your base. Both Papandreou and Samaras made this mistake—they tried to please their base and failed, and their failure threatened the very existence of their parties (in particular, Papandreou). You cannot be a reformer and try to please everyone. Tsipras needs to understand that the 38.7% which voted “Yes” on the July 5 referendum will give him enormous latitude to rule and upend the structural absurdities of the Greek economy and society. The thirst for changing Greece and cuts across ideologies and parties—Tsipras can lose supporters but he will gain many more if he is serious and he succeeds. His willingness to break ranks with his party and to embrace a whole cadre of people who opposed him is testament to his ability to do this. I count myself among the people that Tsipras can win over if he stays on the path he’s on. Fourth, keep selling the big picture. Neither Papandreou nor Samaras offered a particularly compelling picture of where they wanted to take Greece. Even Tsipras, so far, has only sold Greece “independence” or “exit from the Memorandum.” This can serve an electoral purpose but they’re not the platform that can animate and guide a country. Tsipras needs to keep selling the destination, keep telling us that the reforms being implemented are necessary to create a fairer, more prosperous and stronger Greece—a Greece that will never again be so weak as to have to accept the conditions imposed on it this weekend. Guy Verhofstadt asked Tsipras if he was going to be the new Venizelos. Remember that Venizelos came to power after Greece had lost a war, declared bankruptcy and had accepted international supervision of finances (ring a bell?). And yet he found the courage to turn the country around politically, militarily, economically, diplomatically and socially. I hope that Greece hit rock bottom this weekend and that the long path to recovery has started. Tsipras just needs to avoid the mistakes of his predecessors. Is It Time for Greeks to Bail-in Greece? Today’s lengthy and inconclusive Eurogroup could be summed up in one word: trust. After five years of broken promises, five months of non-negotiations, and five days of a vitriolic referendum campaign, most Europeans no longer trust Greece to fulfill its promises. And without trust, there can be no more money. Greece has no time to regain trust; instead, it needs to make a bold move. Now, before we blame the Germans or Finns for their stubbornness, let me ask my fellow Greeks this: Would you lend money to the government today? Would you trust Alexis Tsipras and his cohort with your savings? Do you believe that the government is willing and able to carry out the reforms that it is pledging? If yes, great; if not, how can you ask the German and Finnish taxpayers to trust a government that you do not? Here is my audacious proposal: structure the next bailout as a “matching funds” package whereby foreign money is disbursed in a fixed ratio to domestic purchases of Greek government bonds (maybe even bank equities). For every euro provided by a Greek citizen, European taxpayers and the IMF would offer three or four or five euros. This way, Greeks would invest alongside other taxpayers and would show, tangibly, that they trust their own government. This is my syllogism. Since 2010, household deposits in Greek banks have fallen by €85 billion. Part of this decline, of course, has been caused by people tapping into their savings to cope with a devastating crisis. But a huge part, including the €25-plus billion gone since November 2014, has been capital flight as Greeks have moved their money overseas or outside the banking system. And none of this includes Greek money that has always been overseas. In other words, if Greeks trusted their government with their money, they could easily finance the €80-odd billion that the Greek side is asking for in its third bailout package. Of course, there is still an issue of debt sustainability—why would a Greek lend to an over-indebted government? We will get to this below, but my point is this: Greece needs another bailout because no private investor, Greek or foreign, is willing to lend it money. If Greeks are not willing to lend money to their government, why should others? My sense is that a new package and even debt relief would be more palatable to taxpayers if Greeks were willing to co-finance it. In theory, Greek purchases could even help lower the nominal value of debt—if, for instance, Greeks bought debt whose maturity was far into the future. Tapping into the wealth of the Greek people, which is still substantial, could change the economics, politics and symbolism of the third bailout. It would also demonstrate trust in the most concrete way possible. For years, Europeans and the IMF have complained that Greek governments have never owned up to the programs that they committed to. What better way to own a program than to, you know, own it? At no point since the referendum was called two weeks ago have I felt more optimistic about a deal being reached between Greece and its creditors. Of course, the obstacles are still many, but there is, finally, a case for some optimism. In retrospect, it is clear that the referendum, destructive as it was for the real economy and divisive as it was for Greek society, served to accelerate the prospects for a deal. First, it decimated the opposition and thus removed, at least for now, the prospect of a short-lived Tsipras government (which has always been his greatest fear). This allowed for a broader pro-deal coalition to emerge. Second, it produced a sharp rebuke from Europe, which put Grexit squarely on the table, thus forcing the Greek side to ‘cut to the chase’ as well as guaranteeing that the pro-European Greek opposition parties will support any deal that comes to parliament because the alternative is Grexit. Third, by virtue of the changes in the domestic and international landscape, it weakened the opposition within SYRIZA. Of course, there are still objections within SYRIZA, but these are no longer enough to hold back Tsipras because they are no longer enough to threaten his survival. With the changes in leadership (#Varoufexit) and the cover provided by France, Greece seems to finally have both a diplomatic strategy (which includes negotiations and back-room dealings rather than merely walking into a room and lecturing people—a la Varoufakis); and it has a substantive plan that includes many of the proposals that the Greek people just rejected in the referendum as well as long-standing reforms that were either never introduced or never implemented. In short, the basis for negotiations is much more solid, although debt is still hanging as an issue without an indeterminate conclusion. The reaction with SYRIZA has been muted, with energy minister Panagiotis Lafazanis making the loudest noises (here, in Greek). A press report from the German newspaper Bild that SYRIZA would substitute ANEL with Potami in the government coalition seems to have quieted ANEL (whose leader made no mention of the military cuts in the proposal, even though that was a red line for him). By all accounts, it seems that parliament will offer Tsipras the cover to go ahead and negotiate a deal on the basis of the proposal sent today, although we can never be sure of the political costs that will be incurred in the process. In Europe, the mood is more mixed. On one hand, Greece seems to have found some important allies, and the fact that there is finally a serious negotiating team (= not Varoufakis) who can engage in real numbers must be such a relief that in itself improves the prospects for a deal. Moreover, Donald Tusk, EU Council President, tweeted that “Realistic proposal from Athens needs to be matched by realistic proposal from creditors on debt sustainability to create win-win situation.” Thus the debate on debt intensified, although Angela Merkel said that a straight-out haircut is impossible but that other debt relief might be achievable. As always, the hardest line came from Wolfgang Schäuble who suggested that Athens needs to regain some trust by actually doing something rather than just promising to do something (and this could explain the rush parliamentary gathering scheduled for Friday). Of course, this is a rapidly evolving game: we still do not know how all of SYRIZA will react, nor do we know whether the proposals from Athens are enough to erase the ill-will created by the referendum; nor do we know whether the Greek people will openly accept a new memorandum that is clearly worse than the memorandum they just resoundingly rejected; nor can we be sure that any deal will be durable since implementation in a SYRIZA government might well lag. But it does seem that Tsipras is set on getting a deal and has enough political cover to do. 8 July 2015 Recap: What Does Tsipras Want? How do you want to be remembered [Mr. Tsipras]? As an electoral accident who made its people poorer in his country? Or won’t you be remembered, Mr. Tsipras, as a real revolutionary reformer? In the tradition of Trikoupis and Venizelos? More or less, this is where I am at. Before I lay out the options as I see them, let me reiterate my sense that Tsipras is genuinely seeking a deal. My latest data point is this: since winning Sunday’s referendum, Tsipras had done very little “campaigning.” He has engaged other political leaders in Greece, he has gone to Europe, and upon his return from Strasbourg today, he met with the President of the Republic and consulted with oppositions leaders. Recall that last week Tsipras was on TV almost daily, making attacks against the creditors and upping the rhetorical ante. We see none of this this week. In other words, to come back to yesterday’s question, “what would Tsipras do differently if he wanted Grexit,” he would be keeping up the rhetorical attacks to be able to claim that “they forced us out of the Eurozone.” Instead, we have heard very little from him, even after the European Central Bank sent clear signals on Monday that the wiggle room that Greece has is narrowing. Greece has several pathways, all difficult and burdensome. But the worst, the more exhausting, the most humiliating and the most unbearable is the surrender and submission to the institutions of the European Commission, the European Central Bank and the International Monetary Fund. This ultimate submission we ought to avoid at all costs! (emphasis in original). In case anyone missed the message: drachma trumps a new deal. So where does this leaves Tsipras? It is well understood that Tsipras called a referendum because he could not get a deal through the SYRIZA hardliners (this much was admitted by the now finance minster Euclid Tsakalotos). But the referendum has strengthened Tsipras both within his party and with the Greek electorate, so the dynamics have changed since two weeks ago. At this moment, Tsipras has two options. First, he can stick with SYRIZA and lead the country out of the Eurozone and maybe the European Union. Since the Greek people still want to be part of the Eurozone, Tsipras would likely pay a cost for such course of action, although he would probably couch it in strong populist and nationalist rhetoric and thus survive. What is not clear is whether the opposition can be mobilized to raise the stakes or even to block him. In this scenario, SYRIZA would emerge as a dominant party for now but is likely to face enormous economic challenges straight away, and its electoral strength will dwindle since it will not be able to deliver on its promises of making life better for ordinary Greeks. Whether Tsipras agrees with this assessment (that his troubles will rise outside the Eurozone), however, is not clear. If not, he could be willing to flirt with this idea (the SYRIZA hardliners clearly think that life outside the Eurozone will be better). Second, Tsipras can cut loose the SYRIZA hardliners and seek to lead a grand coalition consisting of SYRIZA, Potami and PASOK and possibly ANEL (Independent Greeks) and New Democracy. The negotiation for such a grand bargain will be intense, however; will there be more power sharing in the executive branch? Will the coalition merely offer a vote of confidence or will it blindly support a broader parliamentary agenda? What kind of reassurances will the opposition parties require in order to ensure that they are not signing their own parliamentary deaths? Will they provide support to let SYRIZA rule for the full four years? At this point, Tsipras seems to be moving more in this direction. The toughest point, as I see it, is the balancing act between what domestic constituents want to hear and what will be acceptable to Europeans. Debt relief has already become a non-issue, with Greece only asking for credible commitments for future negotiations regarding debt relief. The only thorny issues are the fiscal measures that Greece will put forth to achieve its primary surplus; and the reforms that will underpin the return to economic growth. The fiscal measures (austerity) are more or less understood although still being negotiated. Reforms, however, will be hard. On one hand, SYRIZA’s economic platform has a distaste for markets and private initiative and thus it will be hard to develop a program that would satisfy Brussels, the IMF and Berlin. On the other, the list of things that Greece needs is very, very long and it is possible for SYRIZA to draft enough measures that have a modernizing tone (and do in fact modernize) without succumbing to the kind of neo-liberalism that it loathes (attaching oligopolies, fighting tax evasion, supporting inward investment in large projects, etc.). Whether this is enough to get Europe’s attention, I am not sure; what I am sure is that the Venn diagram between reforms that are acceptable both in SYRIZA (even outside the hardliners) and overseas is very small, and it will be a major challenge to find and include them all. By all accounts this will be hard for SYRIZA and for Tsipras to swallow. Debt relief has been a rallying cry in the search for a “viable solution,” and the prime minster will struggle to convince Greeks that a deal without debt relief is a “victory.” Second, a third memorandum will be painful politically and might shatter SYRIZA. And third, SYRIZA’s platform goes against every reforms that the Europeans and the IMF might ask for. In short, this is not a good spot to start from. Yet, Tsipras is dominant in Greek politics right now: he has enormous political capital, he is trusted by the people, and he has an ability to spin. If he comes back from Brussels saying “it is this or Grexit,” he could win a vote in parliament, especially if be brought home a broader package that included European investment funds. The battle in parliament will be bloody, and he will split SYRIZA, but he can probably survive the vote by getting support from other parties. The most important question right now is this: Does Tsipras want Grexit? This is the question that most divides Greeks I speak to: some people think that he sincerely wants to stay in the Eurozone and will do everything in his power to accomplish this; others think that he is executing a well-orchestrated plan to take Greece out of the Eurozone; others still think that he wants to avoid Grexit but is willing to tolerate it if it is better than the alternatives (a new, harsh bailout); and others think that while he may want to avoid Grexit, he is not capable of controlling a crisis that leads to Grexit. My own view on this is mixed and, to be frank, fluctuates. I have never believed in the well-orchestrated plan for Grexit, even though I struggle to answer the question: “if Tsipras wanted Grexit, what would he have done differently?” I understand that SYRIZA’s economic platform is not viable in the context of the Eurozone, although I am not sure that SYRIZA sees it this way (SYRIZA seems to think that by curbing tax evasion, Greece will raise billions of euros that will pay for a state-led economy and generous welfare state). Of course, there are elements within SYRIZA who strongly support a move to the drachma, but the prime minister has never hinted as much to my knowledge. In my gut, I believe that Tsipras understands the harsh historical judgment of pushing Greece out of the Eurozone and even the European Union, and I see some efforts to become more conciliatory after the referendum. I have always believed that Grexit would come as a result of fatigue or an accident, and it seems we are at this stage now. This is not a settled question yet, but it is clear that this question, above all, is the only one that matters. The day after the July 5th referendum was super eventful. The bottom line: the Greek government has a much more solid foundation for reaching a compromise but the overtures from abroad are mixed. On the domestic scene, the departure of New Democracy (ND) leader Antonis Samaras paved the way for Prime Minister Alexis Tsipras to call a meeting of the parliamentary leaders (Golden Dawn excluded). The joint statement of the political leaders, except the Communist Party, captures the consensus: more financing, new (equitable) reforms, a pro-growth program and some commitment towards debt relief (see a translation from Greek Analyst here). Broadly speaking, this gives more space to the prime minster to negotiate a deal. On the negotiating front, the departure of Finance Minister Yanis Varoufakis is a godsend. It has been clear from day one that his tone torpedoed all efforts to achieve some compromise. By itself, his departure will be taken as a serious sign in Europe that Tsipras is committed to cutting a deal. On the European front, the messages have been mixed; there have been some mentions of debt relief, but the overall tone is one of anticipation of what the Greek side will bring to the July 7 Eurogroup and Euro Summit. Then, the Europeans will assess whether the Greek side has made any progress in closing the gaps that prevented a deal from taking place previously. Meanwhile, the European Central Bank (ECB) decided to “adjust the haircuts on collateral accepted by the Bank of Greece for ELA” (whatever that means). At this stage, there are four main questions as I see them going into the next day. First, what deal will the Greek side propose? At this stage, it seems that Greece will put on the table the last deal on offer (see here). This deal accepts the majority of the Jean-Claude Juncker proposal with some reservations. Will this deal be enough to entice the Europeans that something genuinely new is at hand? Or will this be merely seen as trying to resurrect a negotiation that for many Europeans just ended? And how will the most recent deterioration in economic conditions change the calculus on both sides (a likely recession)? Second, how will the Greek people interpret the “No” vote. Tsipras interpreted it as “I have a stronger mandate to get a better deal.” If so, it is possible for him to come back and say, “this is the best that I can get,” and that could be the end of it, at least at the popular level. Politically he could still suffer losses within his party (including defections) but could rely on broader parliamentary backing from ND, Potami (River) and PASOK. There is, however, another scenario: what if a large chuck of the electorate really did vote no towards austerity? How will they react to a deal that includes, most likely, a lot more austerity? This brings us to question number three. Third, how much debt relief is enough to satisfy the Greek side? Substantively, the only major contention is debt relief. The Greek side wants a deal now, whereas most Europeans would like to offer debt relief as a reward for Greece making progress towards reforms and fiscal sustainability. On the European side, it is unlikely to see major concessions, although who knows. On the Greek side, what kind of concessions would suffice? Is it enough to extend the tenor and grace period for some loans? 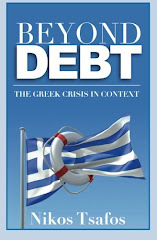 Or will the Greek side demand a drop in the nominal amount of debt? If not, can the Greek side make the case at home that Greek debt, despite remaining at over 175% of GDP, is now sustainable? Fourth, what is the non-fiscal package involved? So far, this has been an accounting exercise with an eye to balancing the budget and producing a surplus. But soon enough the country will need growth generated from meaningful structural reforms. What kind of reforms will the European side demand and what kind of reforms is SYRIZA, in particular, able to credibly commit to? The inability to agree on this package is probably one of the biggest obstacles in the way of a broader deal that both sides can live with. That’s all from me on July 6. As Greece heads to the polls, there is one enduring myth that is worth addressing: that debt brought austerity. This is the narrative: Greece found itself with an unsustainable debt in 2010, and the troika, in order to avoid the repercussions of a Greek default, demanded that Greece take up new loans and implement a very strict diet (austerity). The result was an economic catastrophe, and for years, Greeks have suffered to service a debt that will never be repaid. Greece, the syllogism continues, needs a haircut to breathe and kick-start economic growth. The problem is that this narrative is not true. After five years of austerity, five years of confiscatory tax increases, five years of spending cuts, the state in 2014 barely broke even. Very little of the austerity has gone to pay back debt. Instead, this effort has been about bringing spending in line with revenues. Yes, Greece has gotten new loans to pay back old loans; yes, the Europeans lent money to Greece in order to bail out their own banks; yes, only a small share of those loans went to support state spending; and yes, Greece’s debt burden has risen in relative terms due to a shrinking economy. But none of this has anything to do with austerity. 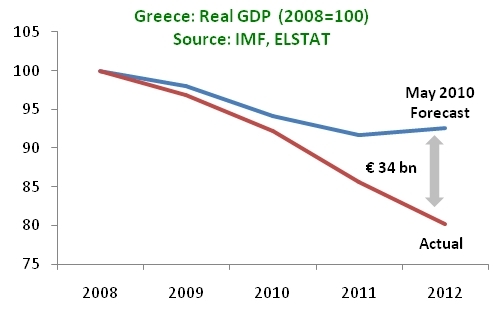 To understand why, recall that in 2009, Greece had a primary budget deficit of €24.4 billion. Primary means without interest payments on debt—which means that even if in early 2010, there was a deal to eliminate all of Greece’s public debt, the Greek government would still be €24.4 billion short (10.3% of GDP) relative to the 2009 numbers. The austerity of the past five years has been about closing this hole and reducing spending to the amount of money that the Greek state can collect. The state finally managed to do this and it ran a primary surplus of €630 million, which is a mere 0.4% of GDP, in 2014 (it also ran a surplus in 2013 if one excludes government support for financial institutions; the IMF excludes it but Eurostat includes it). 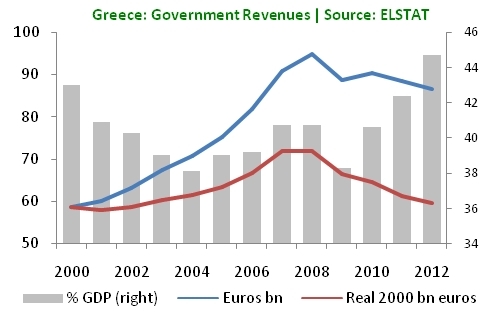 Greece went from minus €24.4 billion to plus €630 million by cutting €34 billion in spending—but its revenues declined by €10 billion because the economy contracted (even though revenues as a share of GDP were at all-time highs in 2012, 2013 and 2014). In other words, this entire effort has been about no longer gaining weight—Greece has not even gone on a real diet yet to pay back the debt. This means that even if one were to assume a debt haircut in 2010, Greece would have had to implement a similar austerity package. There are only two scenarios under which a haircut would have made Greece’s austerity path less severe. First, if one assumes that immediately after defaulting on €301 billion of debt in 2010, Greece would have been able to borrow again in order to finance its deficits (which is impossible; in a 2010 paper, IMF staff estimated that countries regain partial market access after about 5 years). Alternatively, one could say that Greece would have recovered faster because no one wanted to invest in a country with such high debt. That’s a counter-factual that is impossible to prove. I find it implausible given that Greece has never managed to attract serious levels of foreign investment, which would be susceptible to such calculations, and because the major driver of the recession has been a decline in consumption which is linked to austerity. Now, the story going forward is different. 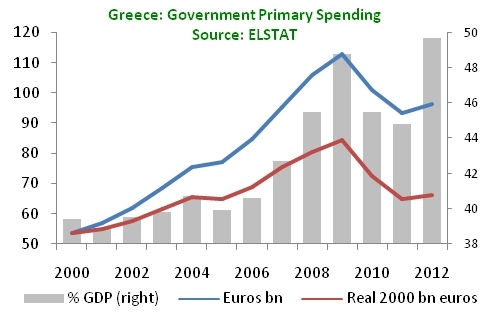 The more debt Greece has, the more of a primary surplus it needs to maintain in order to repay it. The IMF, for instance, said that a primary surplus of 2.5% of GDP is not enough to render the debt sustainable. Many argue that a primary surplus of this scale will impede growth, which is not what the evidence shows, and especially not in a country like Greece were deficits are usually associated with transfers (pensions, wages) rather than investment. But that’s another debate for another day: the important point is that one should not confuse debt and austerity, and one should not think that Greece has had austerity because there was no debt restructuring. Austerity was almost exclusively about the deficit so far. Are the IMF and the Greek government finally on the same side? The Greek government claims that the latest Draft Debt SustainabilityAnalysis (June 26, 2015) supports the government’s position. In reality, it does not. First, the two sides continue to hold fundamentally different views on what is sustainable. The IMF believes that the debt trajectory that was agreed to in November 2012 was sustainable and that it only recently became unsustainable. Finance Minister Varoufakis disagrees with this premise and has always held that Greece’s debt has been unsustainable since 2010. Second, the IMF did not call for a 30% haircut on Greece’s debt. Rather, the IMF noted that, “Using the thresholds agreed in November 2012, a haircut that yields a reduction in debt of over 30 percent of GDP would be required to meet the November 2012 debt targets.” In other words, the IMF is only referring to what it takes to bring us back to where we were in 2012. Plus, the only explicit reference to a reduction in debt is to the Greek Loan Facility (€53 billion)—meaning the European loans! So the IMF says yes to a possible haircut as long as it is someone else’s money. Third, the IMF believes that sustainability will come from primary surpluses (aka “austerity”) and from further reforms, including privatizations. SYRIZA would struggle to implement the reforms endorsed by the IMF and has consistently repudiated a 3.5% of GDP surplus (the IMF baseline); as such, their view on how the debt will evolve will remain irreconcilable. Fourth, the IMF believes that the debt-to-GDP ratio is meaningless for a country with Greece’s debt profile. As such, it focuses on debt concessions that affect the real value of debt, but not the nominal value (prolonging maturities and extending the grace period). This, again, clashes with SYRIZA’s view that seems to focus on nominal debt (the actual amount of debt). Firth, the IMF estimates that Greece needs €51.9 billion to cover its financing needs from October 2015 to December 2018. This assumes that Greece would raise €2 billion from privatizations and €9.4 billion from primary surpluses (1, 2, 3, 3.5 percent of GDP for 2015, 2016, 2017, and 2018). In other words, the IMF assumes more “austerity,” more reforms, more privatizations, and a third memorandum. Prime Minister Alexis Tsipras understands this but not publicly (he rarely references his own requests for new loans). Sixth, the IMF argues that the exceptions it made to its sustainability analysis in the past are no longer valid because the debt is now held by the official, not the private sector. In other words, there is no longer a rationale for throwing good money after bad just to save the rest of the world. This is probably a view that SYRIZA shares, although as noted above, the IMF has not made a public wink towards accepting losses on its own loans. Seventh, the IMF deems that concessions (longer maturities and extended grace periods), more plausible assumptions, and the debt relief that has been promised to Greece since 2012, would make debt sustainable with high certainty. By itself, this would imply that no “haircut” is needed—only extensions in existing debt. However, the IMF notes that if there is father fiscal relief (lower primary surpluses), then Greece would need more aid and a greater haircut (as noted above, they specify the European loans). In short: two different views on what is sustainable and how to get there; a tacit recognition of the need for a third memorandum, more reforms, more austerity, and concessions; and a nod towards a haircut as long as it is someone else’s money. Not quite a consensus. Τελείωσε πια αυτή η εβδομάδα. Με κούρασε, με εκνεύρισε, με τρόμαξε και με θύμωσε. Γύρισα στην Ελλάδα να ψηφίσω γιατί η στιγμή είναι κρίσιμη και βλέπω ότι παίζεται το μέλλον της χώρας. Έξ΄ αρχής το δημοψήφισμα δε μου άρεσε γιατί το θεώρησα άδικο. Τι ακριβώς αποφασίζουμε; 'Αλλωστε όλοι θέλουμε να τελειώσει αυτός ο εφιάλτης και (σχεδόν) όλοι θέλουμε να μείνουμε στο ευρώ και στην Ευρωπαϊκή Ένωση. Στην αρχή πίστευα ότι το ρίσκο ενός ΌΧΙ ήταν πολύ μεγάλο για να δικαιολογήσει τα οποία πιθανά κέρδη έφερνε (μια καλύτερη συμφωνία ίσως). Μετά από μια εβδομάδα το σκεπτικό μου έχει αλλάξει λίγο. Στην ουσία δίλημμα δεν υπάρχει πια. Ο πρωθυπουργός χαιρέτησε την έκθεση του Δ.Ν.Τ την οποία μας καλεί να καταψηφίσουμε. Ο πρωθυπουργός επίσης έχει προσυπογράψει τα μέτρα του δημοψηφίσματος λέγοντας ναι σχεδόν σε όλα. Η μόνη διαφορά που μένει είναι αν η αναδιάρθρωση του χρέους θα γίνει τώρα ή μετά (ως επιβράβευση). Μιας και το χρέος δε μας βαραίνει αυτή τη στιγμή, ουσιαστικό δίλημμα δεν υπάρχει πια. Άρα το μόνο που μένει είναι τι μήνυμα στέλνουμε στην Ευρώπη. Αν πει ο λαός ΝΑΙ, θα υπάρξει μεγάλη πίεση στην Ευρώπη να βρει μια λύση και να αποφύγει ακραίες ενέργειες -- πως αδειάζεις ένα λαό με κούρεμα καταθέσεων μια μέρα αφού σου πει ΝΑΙ; Είναι πολιτικά δύσκολο. Το ΌΧΙ απ' την άλλη είναι πιθανός εγκλωβισμός. Επιτρέπει στον Ευρωπαίο να πει, εμείς κάναμε ό,τι μπορούσαμε αλλά ο Έλληνας δεν ήθελε να μείνει στην Ευρώπη. Ασ' τον χωρίς ευρώ μέχρι να φύγει μόνος του. Ούτε το ΌΧΙ οδηγεί σε λύση: είναι δυνατόν να φέρει ο πρωθυπουργός πίσω μια συμφωνία που είναι κατά 95% ίδια με την συμφωνία που απέρριψε ο λαός; Θα τον φάνε στον ΣΥΡΙΖΑ και δικαίως. Θα χρειαστεί τεράστια σοφιστεία για να περάσουν αυτά τα μέτρα μετά από ένα ΌΧΙ. Φυσικά υπάρχουν πολλές πολιτικές διαστάσεις και οικονομικές επιπλοκές. Ούτε με το ΝΑΙ ούτε το ΌΧΙ θα είναι εύκολα τα πράγματα και αυτό που ράγισε στην ελληνική κοινωνία αυτές τις μέρες θα χρειαστούμε χρόνια να το ξανακολλήσουμε. Αλλά με το ΝΑΙ πιστεύω πως θα είναι πιο ελεγχόμενα τα πράγματα. Καλό βόλι την Κυριακή και καλό κουράγιο σ' όλους τη Δευτέρα ό,τι και να γίνει -- γιατί όσο διχασμένοι και αν είμαστε την Κυριακή, από τη Δευτέρα θα πρέπει να ξαναρχίσουμε να χτίζουμε την Ελλάδα του αύριο. Το παρακάτω γράφημα απεικονίζει το κατά κεφαλήν εισόδημα στην Ελλάδα σε σχέση με την Ευρώπη (ΕΕ-15) σε ισοτιμία αγοραστικής δύναμης (Purchasing Power Parity). Η Ελλάδα όντως «μεγαλούργησε» μετά τον πόλεμο και έκλεισε την ψαλίδα με την ΕΕ: όταν μπήκαμε στην ΕΟΚ, η ευημερία στην Ελλάδα ήταν ελάχιστα χαμηλότερη από την υπόλοιπη Ευρώπη. Η σύγκλιση, όμως, έληξε το 1978, και κατά τη δεκαετία του ‘80 και ‘90 η σχετική ευημερία της χώρας έπεσε σημαντικά. Από το 2000 έως το 2004 υπήρξε μια σύντομη σύγκλιση, η οποία, όμως, δεν κράτησε. Από το 2009 και μετά έχουμε σοβαρή απόκλιση και πάλι, επιστρέφοντας στο σημείο που ήμαστε στις αρχές της δεκαετίας του ‘60. Η σύγκλιση ξεκίνησε με την υποτίμηση της δραχμής (1953) και τη σταθεροποίηση της ισοτιμίας με το δολάριο μέχρι το 1975. Κατά την περίοδο αυτή, η χώρα είχε σχετικά ισοσκελισμένους προϋπολογισμούς (ελλείμματα ~1,5% του ΑΕΠ για δημόσιες επενδύσεις) και χαμηλό πληθωρισμό (~2% τη δεκαετία ’60). Σε αντίθεση, η μεγάλη απόκλιση προήλθε όταν το κράτος άρχισε να έχει σοβαρά ελλειμματικούς προϋπολογισμούς, που κατέληξαν σε επίπεδο πάνω από 10% του ΑΕΠ, και ανεξέλεγκτη νομισματική πολιτική (πληθωρισμός 19.5% τη δεκαετία του ’80). Και ενώ η δραχμή εξακολουθούσε να υποτιμάται τη δεκαετία του ’80, οι εξαγωγές ως ποσοστό του ΑΕΠ έπεφταν, γιατί καμία χώρα δεν μπορεί να αυξήσει τις εξαγωγές μόνο με την υποτίμηση του νομίσματος. Εν ολίγοις, η σύγχρονη ιστορία μας δείχνει ότι η νομισματική σταθερότητα και η δημοσιονομική ισοσκέλιση είναι αλληλένδετες με την ευημερία. Όσες κυβερνήσεις έχουν προσπαθήσει να αποφύγουν του περιορισμούς μιας τέτοιας οικονομικής πολιτικής, έχουν καταφέρει μόνο να μας πάνε πίσω. Ταμπού δεν πρέπει να είναι η δραχμή και όντως οι χώρες μπορούν να ανθήσουν και να μαραζώσουν με ό,τι νόμισμα θέλουν. Αλλά να ξέρουμε και τι λέμε. Ο οικονομικός λόγος που θέλουμε το ευρώ είναι γιατί δεν εμπιστευόμαστε το κράτος να κάνει συγκρατημένη νομισματική και δημοσιονομική πολιτική χωρίς τους περιορισμούς της Ευρωζώνης. Those who feel vindicated by the IMF’s “mea culpa” on Greece should really read what the IMF wrote, rather than select the “lessons” they like. The IMF has produced an interesting report on Greece—but the lessons are hardly the ones that the pundits seem to focus on. The report does not question the overall thrust of policies adopted under the SBA supported program. Fiscal adjustment was unavoidable, as was the sharp pace of deficit reduction given that official financing was already at the limit of political feasibility and debt restructuring was initially ruled out. 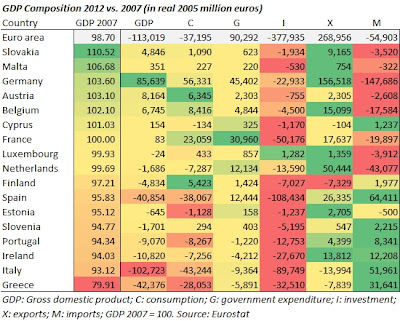 Structural reforms were clearly essential to restoring competitiveness. Some questions can be raised about the types of measures (overly reliant on tax increases) and structural conditionality (too detailed in the fiscal area), but the policies adopted under the program appear to have been broadly correct. (p. 32, emphasis mine). As a result, the headline that the “IMF admits it was wrong” does not quite capture what the IMF said. We need to read more closely. The IMF argues that Greece’s debt, even in May 2010, was likely unsustainable. Yet debt restructuring was ruled by the Europeans for three reasons: (a) reservations about moral hazard associated with debt “forgiveness;” (b) a default would have wiped out the capital of the Greek banking sector, necessitating an immediate recapitalization; (c) the effects on the European banking sector would have been hard to predict but possibly dire. So far, there is nothing to dispute—these facts have been well known and well understood. The issue is not whether the IMF and the Europeans took different views on the merits of restructuring—they obviously did—but whether this mattered for Greece and its performance since 2010. The IMF, by the way, says very little about this. It notes that “not tackling the public debt problem decisively at the outset or early in the program created uncertainty about the euro area’s capacity to resolve the crisis and likely aggravated the contraction in output.” In a footnote, the IMF expands: “The recent paper on sovereign debt restructuring argues that delay in resolving an unsustainable debt situation serves to depress investment and growth in the debtor country and prolong financial uncertainty.” But the paper in question does no such thing—it merely states, again, that a “debt overhang” has a negative effect on economic activity. Of course, it is not clear why these positive things would have happened—why debt restructuring would have allowed Greece to “jump-start” investment and “gotten its economy moving again.” Neither is it clear why Greece would have been able to “cut tax taxes, rather than raising them.” Nor do we know where the “interest savings” would have come from since Greece had to borrow to pay interest—it could borrow to pay interest and service debt or it could default and borrow money to recapitalize banks. As the IMF acknowledges, “it is difficult to argue that adjustment should have been attempted more slowly,” meaning that the cornerstone of the program—tax hikes and spending cuts—would have been broadly similar. However, the deeper-than-expected contraction was not purely due to the fiscal shock. Part of the contraction in activity was not directly related to the fiscal adjustment, but rather reflected the absence of a pick-up in private sector growth due to the boost to productivity and improvements in the investment climate that the program hoped would result from structural reforms. Confidence was also badly affected by domestic social and political turmoil and talk of a Greek exit from the euro by European policy-makers. On the other hand, the offset to the fiscal contraction from higher private sector growth that was assumed during the program period appears to have been optimistic … while some of the adverse political developments were endogenous and followed from limited ownership of the program ... A larger contraction should probably therefore have been expected, although it should be noted that market forecasters were no more accurate. This seems like a much fairer and accurate read of the crisis—not one that blames “fiscal multipliers” but one that acknowledges the linkage between political change and economic activity. The lack of “program ownership” is a persistent theme in the IMF’s report—meaning that the IMF recognizes that Greek politicians were not committed to change. To its credit, the IMF does not say that debt restructuring would have produced the magical economic benefits that several analysts assume. Perhaps because it has been bogged down in this story for three years, it has a more cynical (realistic) view of Greek political economy and the myriad problems that stand in the way of economic growth. It has been almost three years since the Greek government signed up to receive €110 billion from the Europeans and the IMF. This post is about the flow of funds in that period—how much money has flowed from what source and to what end (see also this post). To examine the finances of the bailout, one has to look at the government’s budget and its broader financing needs (such are repaying debt, recapitalizing banks, etc). Let us begin with the first item (data from ELSTAT, here, p. 23). 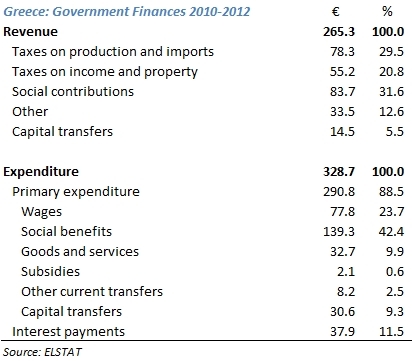 The first line of the chart says that the Greek government received €265.3 billion in the period from 2010 to 2012. Of that, social contributions made up the largest portion, 31.6%, followed by taxes on production and imports (including VAT), which amounted to 29.5%. Taxes on income and property added less than 21%. The rest came from capital transfers (such as EU funding) and other sources. In that same period, Greece spent €328.7 billion, of which €290.8 billion was for actual expenses, excluding interest on debt. This is an important observation. It means that even if Greece had completely repudiated its debt on January 1, 2010, it would still have been short by €25.5 billion (€290.8 minus €265.3). Together with the €37.9 billion in interest payment, the total deficit is €63.4 billion. This is the amount of money that the Greek state needed in order to cover its expenses and pay interest on debt. Goods and services (€32.7 billion) was more or less balanced by “other” revenues (€33.5 billion), while capital revenues (such as revenues from public investment and from EU funding) covered only half of capital expenditures. Collectively, all the other pieces were short €26.5 billion—this excludes taxes and social contributions on the revenue side, and wages and social benefits on the expenditure side. 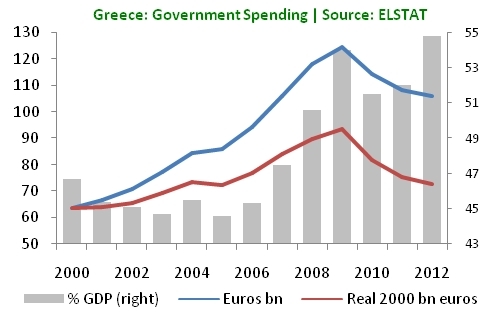 The Greek government needed €247 billion in the period from 2010—2012. Of that, a mere 7.7% went to finance the government’s deficit—the rest went for other purposes. Around 15.4% went to pay interest on debt—this money went to both domestic and foreign investors. Another 12.3% went to repay Greek investors who held government bonds that were expiring in that period. A full 24.3%, the largest item, went to repay foreign holders of Greek government bonds—in sum, almost €60 billion. Around 18% went to recapitalize banks, 14% went to support the PSI (such as buying back debt) and 8.6% went for other operations. In other words, more than 50% of the money that Greece needed in that period was to deal with the country’s excessive debt burden (interest on debt and repaying residents and non-residents). Given that the bank recapitalization and PSI were both, ultimately, linked to the country’s debt, almost 84%, or €206 billion, was ultimately devoted to Greece’s debt—which, at year-end 2009, was €299 billion. Importantly, however, a large sum (€60 billion) went to bailout foreign banks and other investors. So this operation was minimally about covering the current profligacy of the Greek state—it was mostly about covering its pass excesses. Where did Greece find that €247 billion (the totals do not add up due to rounding, so this number shows up as €247.1 billion)? Domestic residents (chiefly banks, insurance companies and the like) provided 54.1 billion (21.9%) of that funding. Privatization receipts covered another 0.4% and borrowing from foreign (private) investors contributed 1.2%. 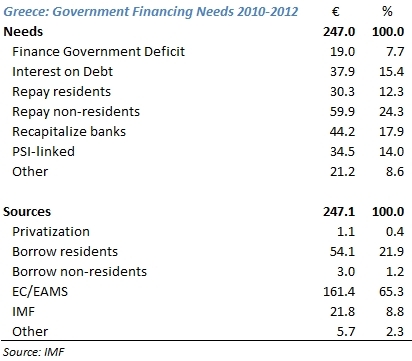 In sum, The Greek state was thus able to borrow money from either its own residents or from foreign investors to cover 23.6% of its financing needs—which would have sufficed to cover the government’s budget deficit and repay residents who held Greek debt (in effect, banks lent money to the government so that the government could repay its debts—so banks were rolling over the debt of the government). In fairness, however, some of this bank lending was only made possible because Greek banks could, in turn, borrow from the European Central Bank. The rest of the funding came from the Europeans (65.3%) and the IMF (8.8%). It is interesting here to note how disproportionate the funding has been between the two sources—much as the troika is often equated with the IMF, the IMF has been a very marginal contributor to this whole package money wise. It is also interesting to note the connection between foreign the inflow of funds versus outflow of funds. Foreign creditors received back €59.9 billion in maturing debt and they received a (likely) majority of the €37.9 billion spent on interest. In all, therefore, almost half the funds provided by the European government governments went back to pay foreign (largely European) investors. In sum, all the taxes and social contributions that the state collected merely sufficed to cover the state’s wages and social benefits. The rest of the balance left a deficit of about €26 billion. More or less, this is what Greece needed to keep running. However, the Greek state borrowed a cumulative €247 billion instead—most of this went to deal with the country’s past excesses and exorbitant debt. Of that flow of funds, the largest recipients were foreign investors, who received about half the money that (usually) their own governments lent to Greece. As we approach the three-year anniversary of the Greek bailout, I thought these four charts would be instructive. 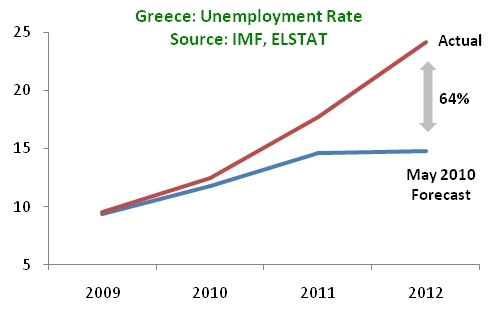 They compare the forecasts made at the time (by the IMF and the Greek government) versus what actually transpired. The first graph shows GDP indexed to 2008. According to the plan, GDP was supposed to bottom out in 2011 at ~8% below its 2008 level. 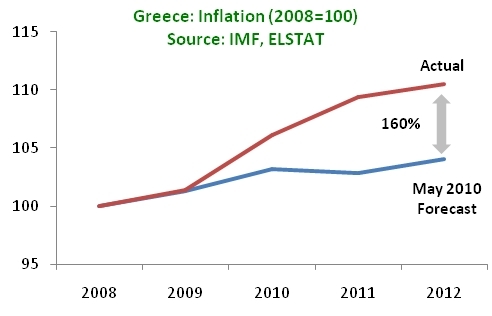 By 2012, the Greek economy was supposed to be growing at 1.1%. Instead, GDP is 20% below its 2008 level and continuing to contract. The current thinking is that growth may come in late 2013 or 2014. The second graph shows the country’s debt. In this case, revisions have changed the baseline. 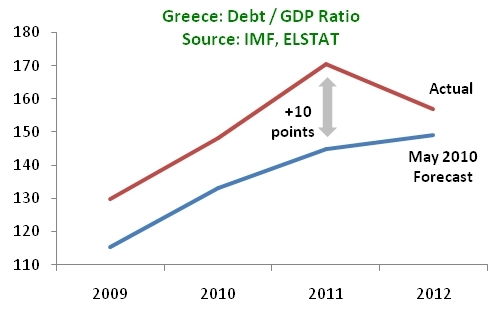 The initial forecast saw Greece’s debt/GDP ratio peaking at 149% of GDP in 2011 and 2012. But this assumed a starting point of 115% of GDP in 2009. Instead, debt in 2009 was 130% of GDP and the peak came in 2011 at 171% before a restructuring brought it down to 157% of GDP in 2012. This forecast is probably the closest to reality of the four shown here. The third graph shows inflation. The forecast in 2010 expected that prices in 2012 would be a mere 4% higher than in 2008. Instead, prices in 2012 were 10% higher than in 2008—a miss of some 160%. As the IMF explained later, it underestimated the monopolistic and quasi-monopolistic structures of the Greek marketplace that would prevent prices from falling. That and steady increases in VAT pushed prices higher, squeezing households. The last chart shows the unemployment rate. The 2010 forecast predicted that unemployment would peak at 14.8% in 2012 before declining to 14.3% in 2013. Instead, unemployment in 2012 averaged 24.2% and reached 26% in Q4 2012. The difference is almost 500,000 people. In sum, the Greek economy has contracted by more than twice the amount forecasted in May 2010, prices have risen 1.6 times faster than anticipated, and unemployment has been 60% higher than expected. Since 2010, Greece’s overriding objective has been to shrink its budget deficit. Much is made of the fact that Greece will soon have a primary surplus—meaning that excluding interest payments, the government’s revenues will exceed spending. A closer look at the country's finances, however, paints a less optimistic picture (data from here). And more worryingly, the retrenchment of state is moving very, very slowly. Revenues. In 2012, government revenues reached a six-year low: at €86.6 billion, the country took in less money than at any point since 2007. On a real basis (controlling for inflation), the picture is even bleaker as 2012 marked a ten-year low, meaning that in 2003, the country collected more revenue on a real basis than in 2012. However since the economy has been contracting rapidly (20% real decline since 2008), revenues as a share of GDP reached an all-time high (44.7% of GDP). As a share of national income, the Greek state has never collected more money than it did in 2012. In effect, higher taxes are preventing revenues from falling in line with GDP—hence the record level of revenues in 2012. Total expenditures. Government spending has showed a similar pattern. On a nominal basis, spending is at a five-year low; on a real basis, it is roughly at the same rate than in 2003—2004. And just as in revenues, total government spending as a share of GDP reached an all-time high in 2012 at 54.8%. 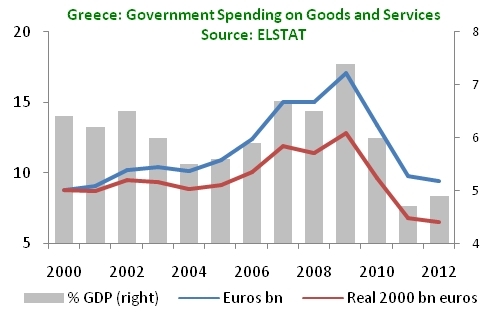 At no point in Greek history has the state spent more money as in 2012. Why is that? Primary expenditures. What if we exclude interest payments? In that case, 2012 is no longer a low point since primary spending increased in 2012 versus 2011. On a real basis, primary spending was at the same rate as it was in 2005—2006; as a share of national income, primary spending was still an all-time high in 2012. The high level of spending, in other words, has nothing to do with interest rates. Primary spending is the sum of six components: wages, social benefits, goods and services, subsidies, current transfers and capital transfers. Let us examine each in detail. Wages (25% of primary spending in 2012). Government spending on wages has declined by 22% on a nominal basis since the peak of 2009; it has declined by a starker 28% on a real basis. On a nominal basis, spending on wages is still above its 2006 levels; on a real basis, it is roughly where it was in 2002—2003. As a share of national income, however, spending on wages remains at high levels—only in 2009 and 2010 did the state spend more on government wages than in 2012. In that sense, the state has made little progress in cutting back spending on wages. Social benefits (46% of primary spending in 2012). On a nominal basis, spending on social benefits has declined by 9.4% since 2009; on a real basis, the decline is starker at almost 17%. Yet on a real basis, the state spent more on social benefits than in 2006. As a share of national income, spending on social benefits reached an all time high at almost 23% of GDP—which is 55% higher than the spending in 2000 (14.8% of GDP). The full data for 2012 is not available on a comparable basis, but spending on old age (pensions) kept rising during the crisis—it was 11% higher in 2011 than in 2008, for example. Unemployment insurance, although it has risen since 2009, still accounts for a mere 5% of spending on social benefits. 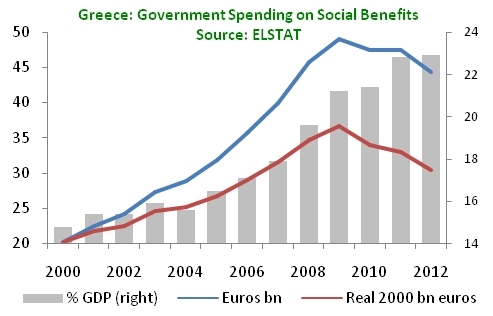 By far, spending on social benefits forms the biggest component of state spending and the main reason why Greece has been unable to lower its deficit further. Goods and services (9.8% of primary spending in 2012). This is the part of the budget that has shown the greatest drop—50% on a real basis since 2009. However, this includes a nearly €2 billion drop in spending on weapons systems, accounting alone for 22% of the drop between 2009 and 2012. Other items (19% of primary spending in 2012). Of the remaining pieces, capital transfers form the most significant portion—they are also the component that rose most significantly in 2012 from €6.7 billion to over €15 billion—presumably, this includes the recapitalization of the Greek banking system. 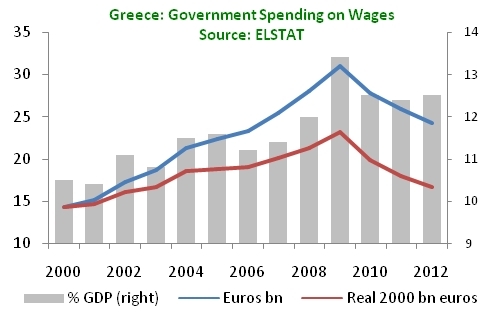 Based on data from ELSTAT, Greece’s budget deficit actually rose in 2012. The Ministry of Finance, in its consolidated accounts showed a deficit of 6.6% of GDP—although the figure for the “Net incurrence of liabilities” puts a figure closer to that of ELSTAT. But what do these numbers tell us? They tell us that the state is alive and well in Greece. Government spending—even excluding interest and capital transfers—was near an all-time high in 2012. Spending on wages and social benefits remains at very high levels—both in absolute terms and relative to national income. Meanwhile, the tax squeeze is pushing revenues to all-time highs despite a sharp contraction in economic activity. The tax payer is thus called to pay for wages and social benefits which persist at either all-time highs (social benefits) or near them (wages). So yes, Greece may soon get to a primary surplus, but without a serious curtailment of state spending—of which the 2013 budget targets—the primary will not do much good. Is the Austerity Debate Relevant for Greece? The debate over austerity has intensified in the past few weeks; this is relevant because folks in Greece will often say that, “research has shown that austerity is bogus, and Greece was just a guinea pig for the wrong idea.” Is that true? 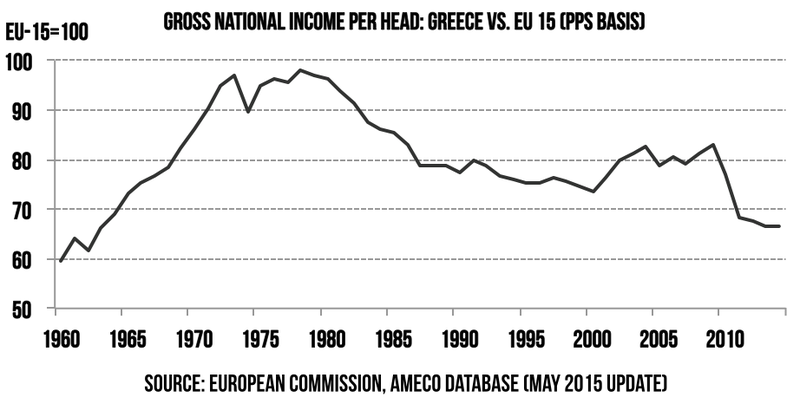 The debate over austerity is, in fact, two overlapping debates—and both debates are mostly irrelevant for Greece. The first debate is whether fiscal consolidation (i.e. cutting spending and raising revenue) can generate economic growth in the short run. The second debate is whether there is a debt threshold after which economic growth takes a sharp hit. (See the end of this article for some references.) Over the past few years, there has been research that supports and rejects both propositions, thus producing highly conflicting messages for policy-makers. 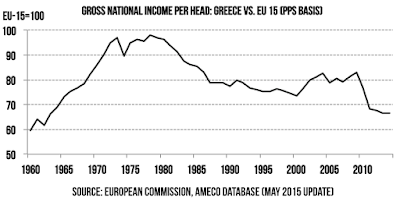 What should one make of this research and how does it apply to Greece? The inability to separate austerity as a precaution and austerity as a last resort leads to great intellectual confusion. It is the reason why everything that Paul Krugman writes about Greece is irrelevant from the start—he is using an “austerity as a last resort” case to argue about “austerity as a precaution.” Of course, at the continental level, “Europe” is practicing austerity as both a last-resort and a precaution since Germany could in fact bail out the periphery by taking on debt itself (or inducing inflation). The problem is that unlike the United States, where there is a long history of federal-state relations, Europe has no mechanisms by which the debt-assuming core could protect itself against the profligacy of the periphery. So Germany may in fact be practicing “austerity as a precaution” but that is as much a political decision (cannot bail out the profligate periphery) as it is an economic decision (fear of rising interest rates or rising inflation). To understand whether austerity makes sense in Europe in general and in Greece in particular, we ought to ask “compared to what?” In 2009, Greece’s budget deficit was 15.6% of GDP in 2009—at that point, fiscal consolidation was not an option but a necessity. Academics and policymakers could have a highly interesting debate about whether fiscal consolidation or deficit spending is the appropriate policy during a recession, but that debate would have been irrelevant because Greece could not choose deficit spending—markets refused to lend it money any more. The options facing Greece were different degrees of austerity: either an austerity of the type that the country has followed or a sharper, front-loaded austerity coupled with default, a new currency, higher inflation and other measures that would curtail the country’s standard of living. Assume an economy with ten people, each of whom spent €1,000 per month. One morning, a person walks into this economy with a gun and threatens to shoot anyone who spends over €800 a month. Consumption falls by twenty percent. Then, one person disobeys and is killed. With only nine people left, the economy now consumes only €7,200, a 28% decline from its peak. On paper, an economist might look at this economy and think it needs a monetary stimulus through lower interest rates. Or, the economist could say that the government should step in and support consumption directly since private consumers are not consuming. Of course, both suggestions would be absurd—what the country needs is someone to stop the guy with the gun. A Keynesian stimulus in an economy with underlying ailments is akin to trying to heat a room with an open window—the heat will help, but best to close the window first (pp. 84—85). In the case of Greece, for example, arguing that the country would benefit from deficit spending is lubricous (even if it were possible, which it is not). When the recession started in 2008, real primary spending grew by 6.8%; in 2009, as the recession deepened, it grew by another 4.9%. In other words, the economy got a government stimulus of about +16% and yet the economy fell into recession. It would be hard to argue that in the 2006—2009, when the size of the state grew by a fifth, the problem with the Greek economy was insufficient government spending. The opposite was true. Nor does one get a complete picture of “austerity policies” by merely looking at the headline figures. As I have written in the past, Greece’s policies are anything but austerity (see here, here, here, and here). Even in 2012, spending on government wages was barely below its 2010 levels as a share of GDP and considerably above what it was in the period from 2000 to 2007. Spending on social benefits reached (again) a historical high, and no, this is not because of generous unemployment benefits. Structural reforms, on which any fiscal consolidation really depends, have lagged and effectively stalled. In that environment, it is hard to create growth and it is hard to convince investors to lend you money because they see that you are not serious about cutting your deficit. In sum, diagnostics matter. Details matter. The research on austerity can yield some insights but most of these are not very applicable to Greece’s case. Greece’s problems are painfully banal and they don’t need cutting edge to diagnose or cure. They require common sense and political courage. No amount of research can change that elementary fact.